The H. Wilson Tuffy Open Shelf A/V Cart is a welcomed addition to any school, business, or office setting. This rugged cart can serve a wide variety of functions but is most usable as an A/V cart for TVs, VCRs, and other audio-visual gear. The 3-outlet electrical assembly has a 15' cord which makes the cart usable from just about anywhere in the room. In addition, the electrical attachment is recessed to insure easy passage through doorways and other tight spots. 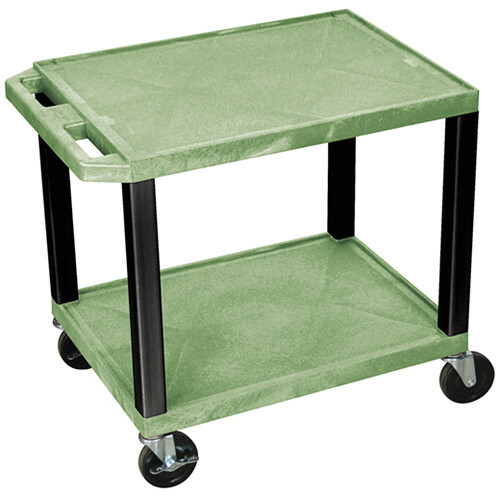 The silent 4" casters assure silent running when rolling this cart through the halls. Finally, as an added security measure, each of the shelves feature a 1/4" retaining lip that prevents slippage - a real money and potential lifesaver.